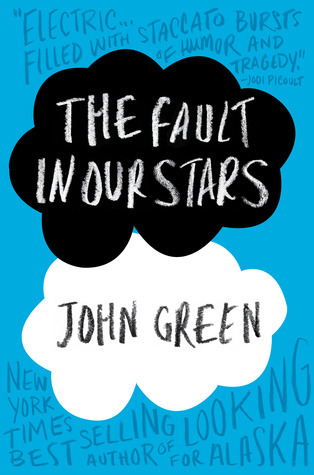 This was the first book I've read by John Green. I've only seen maybe two of the Vlogbrothers YouTube videos. It's not like I'm some crazed John Green fanatic. I'm almost too worried to read another book by him because now I have high expectations. I say this so you understand that this book really did blow me away, and it wasn't just because I was already biased to like the book. I wish I could put into words how absolutely fantastic this book really is. My words, however, do the book no justice. I was in tears for last couple chapters of the book, which does make it difficult to read. It’s one of those books I just want to shove into everyone’s hands and tell them they must read it. When I finished the book, I immediately turned back to the beginning and reread it. I have never done that with any book before. This book ripped my heart apart and then somehow stitched it back together again. It’s a book that takes you awhile to recover from. I expect it will stick with me forever, and I think maybe it has changed something inside me. I know that sounds ridiculous and cheesy, but I’m not being dramatic. This book had me laughing so hard I was in tears. Then I was in tears because of the overwhelming feelings the book inspires. The characters are amazing. They're teenagers, but they are going through things that most of us couldn't begin to imagine. Green does a wonderful job balancing the angst of teenagers with the maturity that comes with facing adversity. Hazel and Augustus are eccentric and yet still very grounded. The book is filled with their existential ponderings which add great depth to the story. Isaac behaves in a way which is a little closer to what most people might think the average teenager would react. There are parts in the novel, mostly with Kaitlyn, which make it seem like this is a book written by an adult with preconceived notions of how teenagers act, but overall I think it's believable that the characters could be real teenagers. The plot is incredible with some unexpected twists and turns which ground the book in reality. The pacing is pretty solid throughout the book except perhaps towards the end where it speeds up. I wasn't prepared for the ending and then it was over. However, I hesitate to call that a weakness in this story because it really happens that fast sometimes. That feeling of imbalance in the world is completely realistic. I don't want to say more than that for fear of giving something away. But seriously, if I could put this book into the hands of everyone I met, I totally would. "I'm like. Like. I'm like a grenade, Mom. I'm a grenade and at some point I'm going to blow up and I would like to minimize the casualties, okay?" "I'm a grenade," I said again. "I just want to stay away from people and read books and think and be with you guys because there's nothing I can do about hurting you; you're too invested, so just please let me do that, okay? I'm not depressed. I don't need to get out more. And I can't be a regular teenager, because I'm a grenade." "You realize that trying to keep your distance from me will not lessen my affection for you." he said. "All efforts to save me from you will fail," he said. "Why? Why would you even like me? Haven't you put yourself through enough of this?" I asked, thinking of Caroline Mathers. The marks humans leave are too often scars. You build a hideous minimall or start a coup or try to become a rock star and you think, "They'll remember me now," but (a) they don't remember you, and (b) all you leave behind are more scars. Your coup becomes a dictatorship. Your minimall becomes a lesion. Recommend: Absolutely! A must read for everyone!